Book a Bath Kit for your Szechenyi Baths visit to avoid the hassle of carrying your pool gear for sightseeing tours in Budapest. The Bath Kit is also available combined with entry tickets. 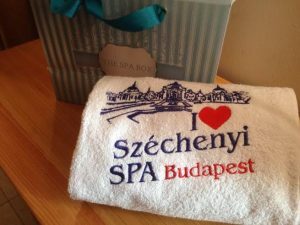 The towel included in the Bath Kit is featuring a Szechenyi Bath logo, which makes it a nice memory / gift of your Budapest holiday spent in the thermal haven of Hungary. Why not make your visit a more relaxed, totally carefree one by ensuring not only a fast track private entry to the bath but booking other relevant rentals and services in advance, as well. 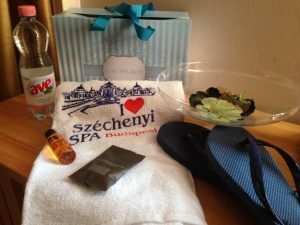 What is more, you can then take the Szechenyi Baths goodies with you, providing lifelong memories of your pleasant visit. Please note that simple bath sheets can be rented on the spot of Szechenyi Baths but only with a deposit of approx. HUF 2,000 (big towels), and a towel rental fee of HUF 1000. Towel (a bit smaller, but thicker and fluffier than the bath sheet) is HUF 2,000 (deposit HUF 2,000). Payment for rental is only cash, in HUF. The Single Taxi Transfer (from Hotel to Szechenyi Baths) is available between 8.30am and 5pm. Check-in at the Baths is between 9am and 6pm. Please add your preferred pickup time in the booking form. Please book min. 1 day ahead. Same day taxi transfer bookings cannot be guaranteed. The packages can be picked up upon check-in at the Help Desk, between 9 am and 6 pm only. The Help Desk is located at the main entrance, opposite the Budapest Circus building. Please do NOT join the queues at the cashiers as they will redirect you to the Help Desk. Szechenyi Thermal Baths is the largest medicinal bath in Europe and were named the Best International Medical Thermal Baths in 2016 (IMTJ Medical Travel Awards). Next Summer Bath Party: Cinetrip Mega Party! I purchased two tickets yesterday but have received no tickets in my inbox. Can somebody please help? Hi, I have just paid for 2 bath kits for 1/19/2019. But never receive any confirmation from you, please kindly check and forward the confirmation to me. I did purchase entry ticket pass before and receive confirmation on that on separate occasion. I just need the confirmation/pickup slip for the 2 bath kits, thank you! Hi, just to have a clarification, is it included the entry ticket with the Bath kit (package 1) or it must be purchased separately? package 1 is only the bath kit without entry ticket. Package 3 would be the bath kit entry ticket. I hope I could help. I have booked a ticket but not have received a confirmation email, and don’t say it has been automatically sent to mu email address because it has not been sent on my inbox, spam or trash folder. Please send it at once because I have booked these tickets for 27/01/2019. Thanks for your help. Is it possible to book package three plus massage all in one package? Looking for 2 persons, 45 minute massage. 1 Thermal, 1 Harmony on Thursday 4th April please. if you wish to have different massage types booked in 1 room, you can make 1x 45 min Harmony and 1x 45 min thermal massage separately and use the comment field to request the massages in the same room.